If you haven’t been living under a rock these past few weeks, you probably have noticed that the Canadian dollar is falling rapidly, despite some spikes here and there (and these spikes are caused by speculators, and not by tangible factors). Ever since Saudi Arabia fixed the oil price at $77, the Canadian economy became in peril. Why? Well, first of all, and regardless what anyone here in Canada thinks, the Canadian economy is not a diversified economy, it’s an economy that is highly dependent on oil (from oil sands). And, in case you don’t know, oil has to be above $60 for Canadian oil companies to make any money. Granted, oil is now hovering around the $80, so these companies are still making profit, with no reason to panic, but it’s a fact: profits are down. The federal government has made some serious decisions affecting the Canadian economy for nearly a decade now based on 2 assumptions: USD/CAD Parity and high oil prices. Both of these assumptions are no longer accurate, which means that the debt will start growing, which means that the Canadian economy will no longer look attractive for mega investors, which means that the Canadian dollar will no longer mean a “bull” dollar, which means that we’re heading for inflation. Inflation, of course, will cause everything to become more expensive, especially fruits and vegetables which are mainly imported from the US (in USD). This means that the purchasing power of the CAD will drop (because everything else will follow), which means that, at one point, the Bank of Canada will start flattering the idea of increasing interest rates. A 1% rate increase will be insignificant to stem the inflation that is heading our way. 4% or 5% would be a start, and such a rate increase will create another problem: high mortgage rates. Most of the people I know, who have mortgages, will literally become bankrupt if the bank increases their rates by a mere 2%. Imagine what will happen if the rate increase is double that number (4%), and you will get an idea what will happen to the Canadian economy. So, the Bank of Canada will have another option, leave the current rates unchanged and allow the Canadian dollar to freefall, probably until it reaches the $1.5 level (which is a sustainable level). Once that level is reached, which can happen in as little as 2-3 years, the Bank of Canada can start intervening slowly to stem further drops in the value of the CAD. Of course, this will create a mortgage crisis (which, from my perspective, is unavoidable), but it won’t be as hard as if it’s done now since there are many Canadians who make their monies directly or indirectly out of the US, which means that they will be able to afford the higher mortgage payment in CAD (A mortgage payment of $2,000 made in 2017 will be more or less like a mortgage payment of $1,400 made today). The Bank of Canada has to choose between the lesser of 2 evils – and the lesser of the 2 is to let the Canadian dollar float, which seems to be what they’re currently doing. If you have a large purchase in Canadian dollars at a fixed low interest rate for a long term, then now is probably the best time to do it. When I settled in Canada permanently back in November 2005, I stayed for a couple of weeks with a friend. A friend whom, without his help, I would have probably had a very hard time settling (and most likely I wouldn’t have had the opportunities I had), but he made everything easier. Thank you Jeff! These boots belonged to his grand father. His grand father fought with the Allies in World War II while wearing these boots. He then wore them until he died. When he died, he passed them over to his son. His son used them a bit and then gave them, in his turn, to his son (my friend). Back then I felt that the story was impressive: wearing your grandfather’s boots, the same pair that was used in a war that changed the course of the world. Shoe makersShoe companies no longer want to build shoes that last for a century, they want you to buy shoes that last for a few months so that you can through them and buy another pair in the same year. Car makers no longer build those strong cars that can sustain shocks, corrosion, rugged driving and terrain condition… Car makers are intentionally building good looking but plastic cars that will fall apart in a few years. Back in the 90s, only Japanese cars were considered made out of Pepsi cans – nowadays even German cars are built from the same plastic. Air conditioners break 3-4 years after first use – compare that to the American Air Conditioners that were built back in 1960s and still work until now. It seems that someone, somewhere discovered that his business will do much better if he makes the same customer buy the same thing over and over again over the course of his life. Obviously, everyone else followed. And now we live in an era of disposability, where everything created by man is disposable. But that’s not as tragic as the fact that we, as humans, have grown to treat each other as disposable and replaceable. Back in 2011, when I used to be actively trading many bank stocks, large investors were generally excited about their prospects (their refers to the bank stocks) when the economy rebounds. Even Warren Buffett bought about 5 billions worth of shares in Bank of America. But, a few months after Buffett made that move, the stock tumbled to $5 (yes, five dollars), which means that Buffett, in late 2011, lost about 50% of his investment, or $2.5 billion. Fast forward to 2014, and BAC is now trading at about $17, still below the $18.41 achieved back in April of 2010, and way below the pre 2008-2009 financial crisis level, when it was trading for about $50. As for C, it is an even more depressing story. C, at $50, which is $5 before the reverse split, is merely trading at 10% of its pre-recession value. S&P’s index, which both BAC and C are included in, is now 30% above its pre-recession value. The Dow Jones is now just below 20% above its pre-recession value. In other words, the major bank stocks, BAC and C, have underperformed probably every other stock in the two major indexes. Hardly the potential large investors promised and believed in back in 2010. If you’re eying bank stocks for long term investment, then it’s possible that you haven’t missed the train for big returns. Just be very careful and do your due diligence before you taken any decision, and always invest with money that you don’t need. I have the Sony Google TV, and I think I am one of the first people who bought it (back in 2012). I use it every day to watch videos on YouTube (I love watching the Sherlock Holmes series, the one from the 80s-90s starring Jeremy Brett), I also use it to occasionally stream movies on Crackle. Crackle is no longer supported on GoogleTV. You can still use Crackle on your PC or your Android device. What was surprising is that it happened all of a sudden (much like everything else these days), but what wasn’t surprising is that it happened: The service wasn’t working properly on Google TV (it was working, but not properly) and it was probably costing Crackle more money to maintain than it was actually making through advertising revenue. What was a bit ironic is that Crackle is a Sony business, and it is no longer working on that Sony device. Sony seems to be taking a very proactive approach towards its services and products recently, immediately canceling those that are deemed unprofitable or generating losses. I’m not sure I will miss Crackle as much as I miss the VAIO laptop, maybe because I can live without it or maybe because I can still use it on my other TV (which is Android powered). Amazon became public on May of 1998. Amazon started trading at $18/share (Google Finance shows that it started trading at $1.5, but remember that the stock was split 1:12 between 1998 and 1999). Females constitute about 65% of Amazon’s traffic. AMZN had 3 splits between June of 1998 and September of 1999. In short, 1 share of AMZN back in 1998 is 12 shares of AMZN at the current moment. AMZN was hardly hit during the NASDAQ crash of 2000. However, even in its worst days, its price remained above IPO level. It took AMZN 10 years to regain its 2000 peak price. If you bought 1,000 shares with AMZN back in 1998 (worth $18,000) and kept them to this date, you would have $3,936,000. April of 2007 was the most active month for AMZN, where 250 millions shares were traded (about 10 times the average). AMZN is trading at a P/E of 862, which means that it’ll take Amazon 862 years to pay off its investors. Every time a new iPhone is out, Canadians wait in line every day for months (until the new iPhone is available in abundance) to buy it. For the untrained eye, this might look like a Canadian obsession with new technology, especially with new iPhones. But, for those of us who have a little more knowledge about Canadians, the real reason lies elsewhere. In Canada, and unlike the United States, Apple stores sell new iPhones unlocked (e.g. not restricted to a certain carrier), and these phones are usually worth a lot more than locked phones, and can be sold to anyone anywhere since they can work in any country and with any carrier. Those obsessed Canadians are not really obsessed. In fact, they probably couldn’t care less about the iPhone, because the second they buy it, they will try to sell it on eBay. If you check eBay right now, you will see a bunch of unlocked iPhones being sold by Canadians (and only by Canadians), sometimes for $1,000 more than the original price. Not too bad for waiting in line for a day’s work of doing nothing other than waiting in line. So, if you pass by a long line of eager Canadians waiting in front of an Apple store to get the new iPhone, then remember, it’s not about the iPhone, it’s about the money! 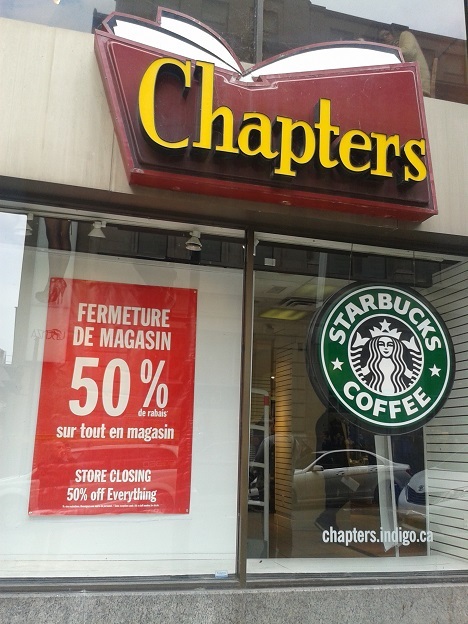 Chapters, the famous book retailer and a landmark for every book reader in Montreal for decades, is now closing its doors. It’s a very sad move, but it is not surprising. After all, most people who buy books are buying their books online and they’re increasingly buying them in a digital format, and most people who used to buy books are now busy on social websites spreading rumors or gambling spending their dollars playing candy crush and other nonsense on their mobile phones. 1. Its physical proximity to the retail store of its parent, Indigo. 2. The skyrocketing rent and heating bills in Montreal (we’re talking about $400k/month for its four storey building). So, what’s with the Einstein quotes in the beginning of this post? Well, it seems that this prediction may very well come to being realized. If all our books become online, and if the online world, for one reason or another, disappears (you can use your own imagination on how it can disappear), then we will lose the tens of thousands of years of accumulated knowledge, it’ll be like burning the library of Alexandria all over again, but exponentially more harmful to the human civilization. Are Hybrid Cars Really Worth It? If you’re shopping for a new car, then you might be tempted to buy a hybrid car. You know, instead of the 8 liters/100km average fuel consumption, you will get 5 liters/100km. That’s about 40% savings in gas! Assuming that you drive the average 16,000 KM/year (10,000 miles) and at the price of $16 per 20 liters for gas (or 3 dollars/gallon – which is already the gas price in some US states and the predicted gas price this fall), then this means that you will be spending $1,024 for a non-hybrid card/year vs $640 for a hybrid car. You’ll be saving about $400 every year! Wow! You should go and lease/buy yourself a hybrid car right now! Right? Well, not so fast! Hybrid cards are usually $8k more expensive than non-hybrid cars, which means that if you’re leasing the car for 48 months, then you will be paying about 55% of that 8k in your lease, which means that you will be paying about $4,400 for the lease term. Assuming the lease rate is 0% (which is rare), then your lease will be costing you around $1,100 year extra! So, the savings of $400 every year will translate to an extra payment of $700 every year! $700 that you can use to go to exciting places or slightly enhance your lifestyle. But, what if you’re buying the car? Well, actually, it gets worse, since you will need to replace the batteries of a hybrid car every 6 years or so, and, as you might have probably guessed, these batteries are not cheap. In fact, they cost about $6k for a small hybrid, so you’ll have to pay $6k every 6 years, which means $1k every year. Yes, that’s an additional $1k/year to own a liability. One last thing to mention, driving a hybrid car is not a very enjoyable experience, especially if you like driving. Oh, and hybrid cars are not environmentally friendly at all. In fact, those batteries are much more harmful to the environment than all that gas you could have spent. I think hybrid cars, the way they are right now, are not worth it and are actually more costly on the short term or the long term. If you have been suckered into thinking otherwise, then all I can say to you is tough luck! 3M (NYSE:MMM) – An Excellent Stock? If there is one stock I wish I had bought a long time ago, it is 3M (NYSE:MMM). Since the huge dip in 2009, the stock has seen nearly a 300% increase, which is comparable to the best performing stocks in the market. What makes this stock very attractive is that it’s consistent. It doesn’t fluctuate a lot and the trend is nearly always up. It’s also a very old stock (the company became public in 1978) and 3M itself (which is best known to the public for its now obsolete sticky notes) is a very diversified company. Their products cover healthcare, transportation, communications, security, graphics, etc…. I didn’t know that 3M was that diversified until I researched it prior to writing this post. Currently, 3M is trading at a forward P/E ratio of 20, which is excellent for this type of companies. Its market capitalization is currently set at $93 billion. I think the prospects of 3M are very bright and I think that one needs to consider this stock in his long term portfolio. This stock nearly doubles in value every 5 years! Better than the best of investments!